Traveling alone may seem intimidating. Try some of these top travel tips to ease any anxiety while traveling by yourself. You should know the very basics of the history of the place you travel to. When I’m planning a trip to a new country I like to watch movies or read books from the country in order to give me a little more of the flavor of that particular place. I also look for local English language newspapers online and borrow guidebooks from the library or from friends. Read up on the cultural norms, any decent guidebook will cover this as well as some basic history. Read my post on preparing for my solo trip to Barcelona. Traveling around using the local buses or metro system is a great way to see a city and have a chance to interact with the locals. I find people often engage in conversation with me while traveling on public transport. Taxis are another option, just make sure you agree on the fare or there is a functioning meter in the taxi. Be wary of unofficial taxis that have no meter. Most frequently I travel by public transportation rather than taxis while traveling solo. My post on getting around in Barcelona covers public transportation options in the city. When I travel solo I always meet more people when I stay in a hostel rather than a hotel. Hostels offer a relaxed environment and most have a common area where you can mingle with other travelers and many include a free breakfast or at least coffee & tea. Many hostels offer dorms as well as private rooms that can be booked online in advance with services such as Hostelworld or Hostelbookers. For more on this topic check out my comparison Hotel vs Hostel – Ritz-Carlton vs Montreal Central Hostel. Lately I have been staying in shared Airbnb accommodations. Mainly I want to socialize and get to know local folks but the added bonus is saving money on lodging costs. Time and again I have been warned against eating the street food and thankfully I have ignored all such warnings! I have eaten street food in Mexico, Brazil, Colombia, Turkey, Indonesia, and China and always enjoyed it. Try the local tea instead of that familiar coffee brand whose name I won’t mention. Try the local beer, wine or other fermented beverage. Eat the Steet Food! 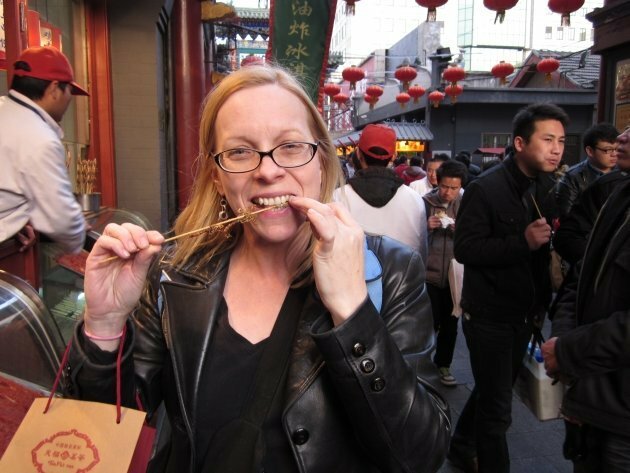 Wangfujing street food in Beijing, China – Susan eats scorpions! Sitting in a cafe or restaurant you can observe how people interact. Observe how people greet one another in different situations. In some cultures personal space and accepted distances between people might be way closer than you are used to. By observation you can begin to learn some of the cultural nuances. Nervous about dining alone? 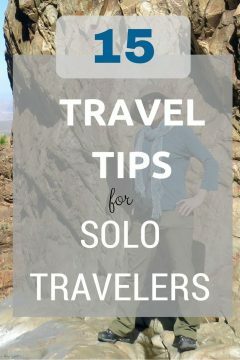 Read my solo travel tips for dining alone. At every opportunity interact with the local people. Make small talk or ask about restaurants, sites, and events around the city. Often you will get some new information that isn’t in any guidebook. People will want to hear about your home country as well so think of it as your very own cultural exchange program. Decide on a few ‘must see’ events or sites or whatever it is that you are passionate about and make sure to get to see them. Then wing it and allow some time to explore a neighborhood for a whole afternoon. When I visited Palm Springs I had a several things I wanted to see but I kept my plans loose and explored something new each day. Spend time walking around the city rather than taking transportation from one site to the next without taking in the rest of the city. Walking is the best way to get the true vibe of a place. Bring two debit/credit cards and keep one of each in a money belt and the other in your handbag. Keep a small amount of money in a pocket so you aren’t revealing a bunch of cash when you make a small purchase. Staying in one location for a week or two (or more) will give you time to see the sites and also enjoy some time to relax, soaking in the new culture. Take day trips to nearby villages or locations of interest but stay in one place in order to really get to know it. Check out the highlights of my trip to Barcelona – 9 days in one city and I still have plenty more to see next time around. Your hostel or hotel is a good resource for information on city tours and group tours to various attractions. You’ll meet others on the tour and you get to leave the transportation planning to someone else. Be wise and keep any expensive jewelry or watches at home. Wear some costume jewelry and a cheap watch that isn’t going to make you a target for theft. Solo travelers are often targeted so take steps to reduce the risk and be aware of your surroundings. Always listen to your gut instinct or intuition. Think of it as an early warning system, it’s alerting you for a reason and you should heed the warning signal. I was nearly robbed once while traveling in Mexico – but I was with someone else and I didn’t listen to my intuition when I knew we shouldn’t have been walking in a certain area. Lesson learned. The more you travel solo the more confident you will become. People that don’t know anything about travel will warn you about all sorts of ridiculous perceived threats. You’ll get kidnapped! Isn’t that the place where (insert natural disaster) happened last year? What if you get sick? Aren’t they (insert prejudice) over there? I suggest you ignore them. What if you never travel anywhere and you regret it forever? I just turned 27 and I have recently decided that I would like to explore the beauties of earth but I am so nervous about beginning this journey…I am not sure where to begin. I have the money and destination (Sydney, Australia) but I am overwhelmed. Any guidance/ advice??? This will be my first solo adventure like this but I recognize the benefits of doing these things by yourself. Decide when you want to be in Sydney and book the airfare. Next book your accommodations. Pack light – bring half the clothes you planned to pack and twice the cash! You already have the money saved and you know your destination, what are you waiting for?! Just go for it!